What should I expect from my Hot Air Balloon Flight? “A MEMORY OF A LIFE TIME”. As your hot air balloon ride begins, the dew covered grass sinks silently away and the earth kaleidoscopes into a masterful mosaic of color and texture. Your memory starts as you float aboard a beautiful nine-story tall balloon and the gentle breezes carry your hot ait balloon flight over the natural beauty of the serene landscape. Sweeping just over the tree tops you are close enough to pick a treasured bouquet, a gift that can only be found on your hot air balloon ride. Your senses will explode with the sweet aroma of pine, oak and magnolia. Your hot air balloon ride has launched you on a magical flight. As your hot air balloon ride continues you will rise effortlessly above the earth for a picturesque view of the forested country-side. During your hot air balloon flight watch closely for a herd of deer, a red fox running through the wheat field, a beaver repairing its dam or even the majestic eagle nesting its young. During your hot air balloon ride you will see everything in a different perspective, as if you are sitting on a cloud. 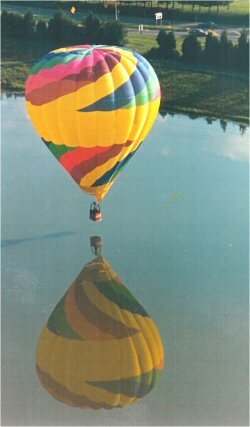 Now you begin to understand the magic of a hot air balloon ride and your first hot air balloon flight. As your hot air balloon ride comes to an end you will join us back at our balloon-port to celebrate your first flight and the memory of your ride. You will also be welcomed as a new member of a very unique group of hot air balloon passengers. From this day forward you will always be known as an Aeronaut, a person who has flown on a hot air balloon ride. 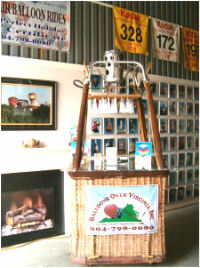 President, Balloons Over Virginia, Inc. The winds have welcomed you with softness. The sun has blessed you with its warm hands. laughter and set you gently back into the loving arms of Mother Earth.